People have been asking the question “Is Joe Flacco elite?” for years (Many of them were joking), but the overwhelming opinion today as that we now have a definitive answer. The Baltimore Ravens got absolutely torn apart by the Jacksonville Jaguars (A team that was mocked to no end in the preseason) to the tune of a 44-7 blowout. Even that one touchdown was scored in garbage time when Flacco wasn’t even in the game anymore. Flacco’s performance definitely stood out the most in the game, because he only managed to complete eight passes, going 8/18 for 28 yards, no touchdowns and two interceptions. So, the internet went to work on pointing that out in as many ways as possible. Ryan Mallett at QB for Ravens. So far today, Flacco has thrown for 11 more yards than Kaepernick. Has two more interceptions, though. 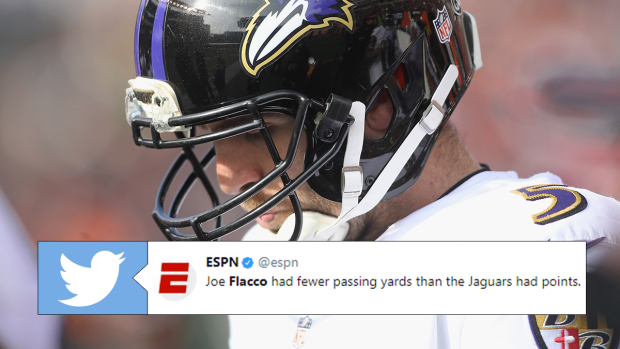 Only two men have -ever- thrown for fewer yards with at least 8 completions than Joe Flacco today. Last one happened in *1978*. Of course, it wasn’t just a stats-based roasting. Many people also chose to point out the fact that Colin Kaepernick still doesn’t have a job – something that Jaguars fans were the victims of in the preseason. Have to respect Flacco's protest today, putting on an emphatic demonstration that Kaepernick should have a job in the NFL. Instead of taking a knee Joe Flacco is going to protest by not completing one pass today.